Each morning, on my drive into work, I swing by Starbucks for a cup of coffee and a slice of their glazed Lemon Cake. I’ve been doing since moving back to New Hampshire, the Starbucks store is a standalone building that yells out to me when I drive be. My point to all this is; when Mr. Macaron asked us to try out their newest flavor, Lemon Cake, I could hardly turn it down. 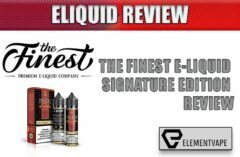 “Just how close can these flavor masters get to a real slice of Lemon Cake?” I thought… Turns out, according to me, and my compatriots in the Spinfuel Eliquid Review Team, pretty damned close. 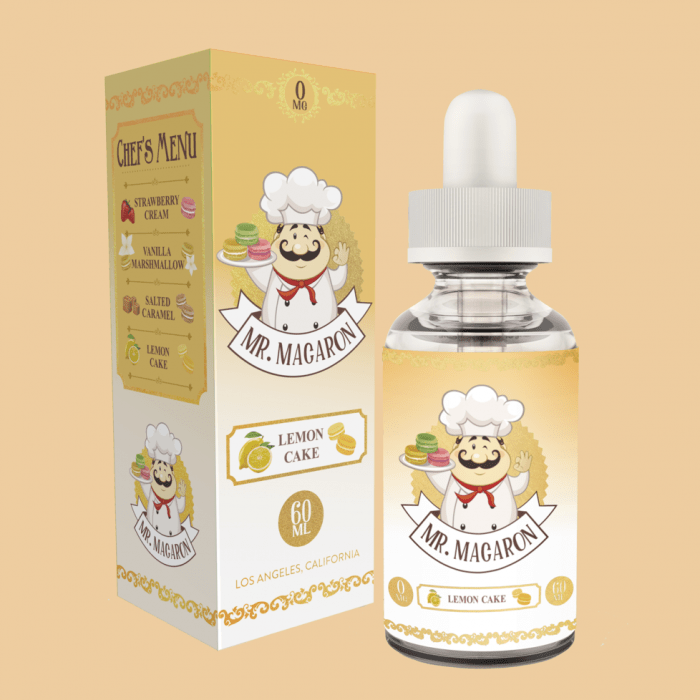 Selling for $20 per 60mL bottle, Lemon Cake is definitely an affordable e-liquid, and the quality is, as with the others from Mr. Macaron Vapes, as high as an e-liquid manufacturer can get. Pure VG, expensive flavor extracts, and at the head of it all is someone who has certainly mastered “flavor”. Check out our previous review for what this team thought of the other delicious flavors from Mr. Macaron Vapes. 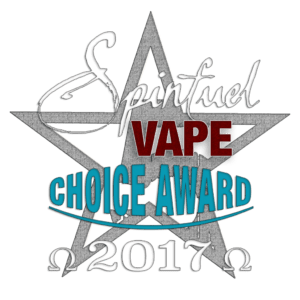 Lemon Cake by Mr. Macaron Vapes is awarded the 2017 Spinfuel Choice Award. Julia: 5 Stars – Using a Uwell Valyrian sub-ohm tank at 77W atop my GTRS VBOY, the flavor and cloud production of Lemon Cake is truly out of this world. If you like Lemon Cake, the type with the icing glaze, then this e-juice will become a major part of your daily vape. Deep, sweet icing and a true non-tart lemon cake richness, I could not get enough of it. My 60mL bottle was gone in 2 days. Definitely buying more, and this magnificent new flavor from Mr. Macaron Vapes will have a spot in my daily rotation for a long, long time. Tom: 5 Stars – I was amazed at how close Mr. Macaron Vapes Lemon Cake is to my daily slice of Lemon Cake from Starbucks. Moist, sweet glaze poured over the top of a rich moist lemon cake that oozes the flavor of sweet lemon and delicious cake makes vaping this delicious flavor something I never to stop doing. I mean, these guys nailed the flavor down. Lemon Cake is not some lemony flavor with barely a hint of cake, this is a true blend of “lemon+cake” in equal amounts, so that while vaping it I’m enjoying the same experience as the real thing, as thick aromatic clouds of vapor. The perfect Lemon Cake E-Liquid. Keira: 5 Stars – Mr. Macaron took a good long while to produce a 4th flavor, and that time was well spent. Who doesn’t love a thick slice of lemon cake? The problem for other eliquid artists was nailing down a lemon flavor that vapers would want to vape as an all-day-vape, and providing a sweet cake flavor to wrap around it. Lemon Cake eliquid is exactly that; real lemon cake in liquid form. And it is incredible. 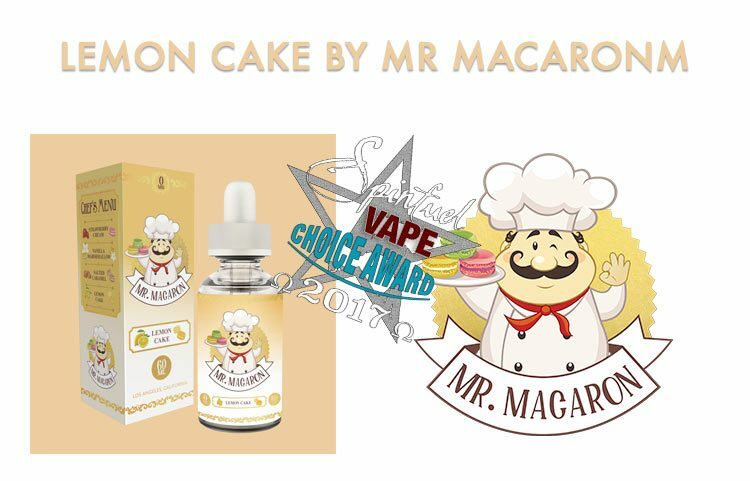 If I had to guess, I would say Lemon Cake by Mr. Macaron is an 80% VG blend because even in my SMOK Big Baby at 100W the cloud production is so thick, so aromatic, that when others are in the room, they want to move closer just to experience the aroma of this amazing lemon cake vape. We’ve enjoyed Mr. Macaron Vapes for quite a while, but when you’re vaping dozens upon dozens of new, or reformulated e-juice, you can put a brand or ten on the backburner. After receiving Lemon Cake, and spending a couple of days with it, all of us want nothing more than to reorder it, along with the other 3 flavors, to make sure it will be a long time before we run out again. Do yourself a favor, if you like Lemon Cake, you’ll love this flavor from Mr. Macaron Vapes. At just 33 cents per mL, how can you not pick up a 60mL bottle and give a try? Best for Sub-Ohm tanks (Kanthal preferred), Lemon Cake by Mr. Macaron Vapes is awarded the 2017 Spinfuel Choice Award.